The secret sauce at Family House is our smart, dedicated and hardworking group of volunteers. The multitude of tasks they perform each day are vital to our operations, and we are grateful for each person who dedicates themselves to us. “Cheryl Batchelor is an inspiration to both her colleagues at SECU and to us at SECU Family House, the credit union’s namesake home. She has built a strong reputation for getting the job done whether in the SECU Information Services Department, preparing a meal for guests at SECU Family House, organizing the SECU Information Services Golf Tournament, or serving as the Family House holiday cookie coordinator in her office. Cheryl was one of five volunteers nominated for this annual award. The other volunteers nominated were Kim Duval, Jean Fetterman (On behalf of Willy, the therapy dog. ), Wendy Maxwell and Carmen Woodruff. Cheryl was unable to attend the breakfast but was represented by several SECU employees, including current board member, Lynn Marcin and former board member, Randal Welborn. 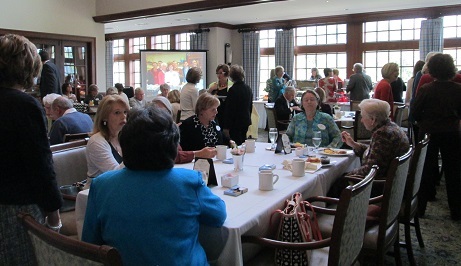 All volunteers enjoyed a scrumptious breakfast at the Chapel Hill Country Club, while the “Metrognomes,” a string quartet from Chapel Hill, played in the background. Dr. Matt Ewend, Chairperson of our Board of Directors, was there to extend his thanks on behalf of the board and the staff. He noted that “Family House is an overlapping community. There would be no Family House without the volunteers.” We couldn’t agree more! We honor our remarkable volunteers and say Thank You, SECU Family House Volunteers for All That You Do! P.S. Our wholehearted THANKS to Allison Worthy, our exceedingly competent, smart, energetic, hardworking, resourceful and esteemed Volunteer Coordinator. On May 9th we’ll be celebrating her 5 year anniversary with Family House. Our Volunteer Program shines brightly and continues to be so successful thanks to Allison!.